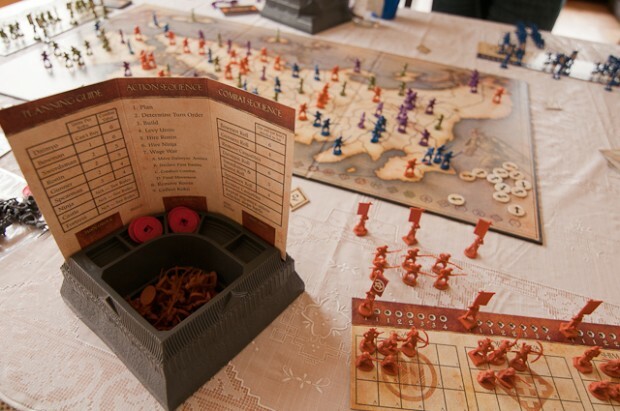 When Axis & Allies was first released it was a part of the Milton-Bradley Gamemaster Series, which also included a game called Shogun, a war game with the setting of Feudal Japan. Released in July 2011, Ikusa is the second reprinting of Shogun (the first reprinting was called Samurai Swords). To conquer an empty province, move in either 1) an adjacent army; 2) one or more units that you remove from an adjacent army; 3) one or more proveincial force units from an adjacent province. The only other changes are with regard to the the components. First, they did away with the useless, fragile, plastic sword and replaced them with cardboard chits, which are used to represent turn order. 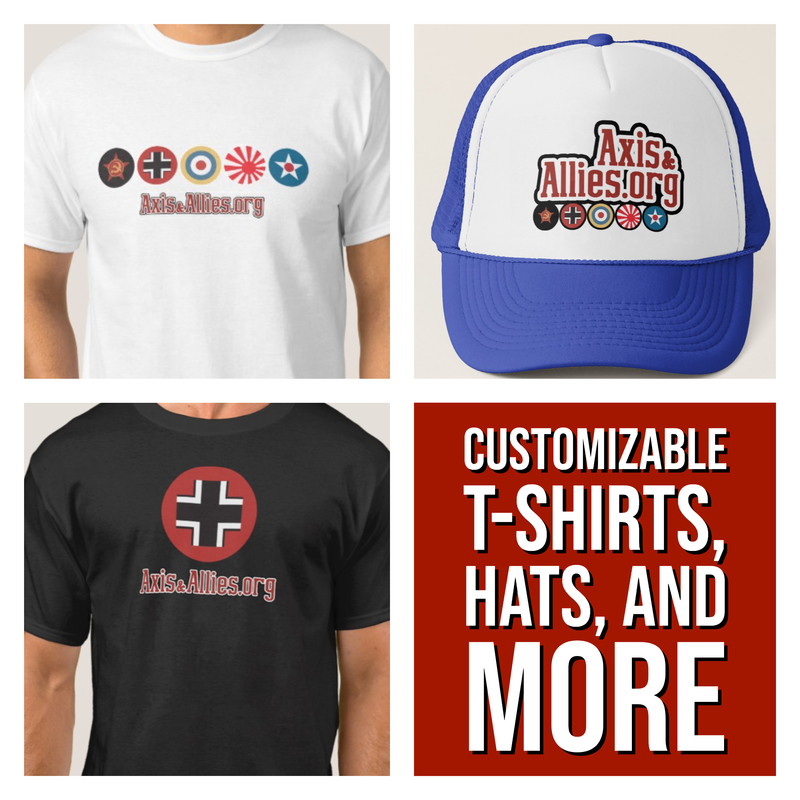 Second, and most important, is the stunning quality of the pieces that are included in the game. Gone are the styrofoam trays, replaced with detailed Japanese castle-themed trays. Each of the daimyos, archers, spearman, swordsmen, and gunmen have a wonderful level of details. The artwork of the board and other cardboard components is fantastic and has it slightly old, antique, and rustic feel with earth-tone colors. Even the colors of the units are bold or earth-toned and not brightly colored. The rulebook is also of very high quality with wonderful artwork. Although you shouldn’t necessarily judge a game solely by the components, the high quality pieces definitely add to the fun of this game. The only trouble I had with the components was making sure that I used the right color stickers with the right color units. I also realized that the shape displayed on the flag of the army sticker matches the base of the army unit it is to be attached to. It’s takes a bit of time to affix all of the stickers so do that before you start gaming night. One of my favorite aspects of the game is planning in secret behind the screen. During the previous turn you collect your red plastic coins, called koku, and at the beginning of the turn you secretly determine how to spend it. The standard actions are build a castle or fortress, levy units, or hire ronin, all of which don’t necessarily need to be done in secret (unless you run out of ronin). The other two actions are important for secrecy: turn order and hire ninja. You can use your koku to determine if you want to go first, last, or somewhere in the middle. Since only one person at a time can use the ninja, the highest bidder wins and if there is a tie nobody wins. The ninja is fun because it allows you to either attempt an assassination on an opponents daimyo (the leader unit of your army), which eliminates one unit as well as renders an army unusable for one turn. If you don’t use the ninja to assassinate, you can save him until the beginning of the next turn to spy on the planning phase for one opponent. After going through each phase of spending your koku as previously planned, we get down to the nitty gritty of waging war. 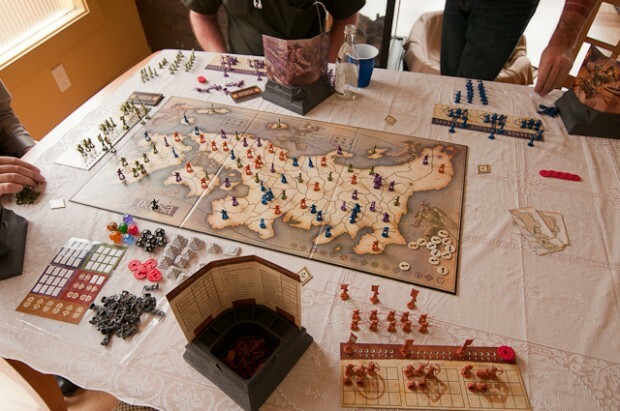 The phases of this turn are: move armies, declare battle, conduct combat, and final movement. 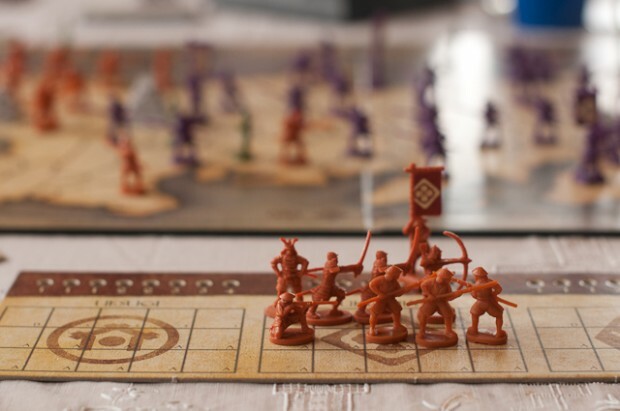 The armies are the only units that move freely around the board. Other units can attack adjacent territories but armies give you the advantage of being able to move in the first and last phase of waging war. The basics of battle are simple, you plan your attacks and roll dice for the outcome. Each unit has different attack values and an each army has stacking limits. An army contains exactly one daimyo, 4 samurai (either swordsmen or archers), and 10 ashigaru (either gunmen or spearmen). During the conduct combat phase you first roll your bowmen and gunmen from each side and remove causalties before proceeding to the next phase, where you roll for your swordsmen and spearmen. At the end of rolling and eliminating casualties the attacker can stop battle or continue. 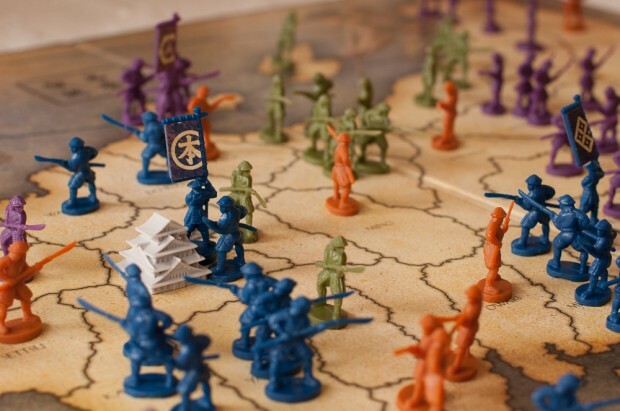 Since battles are planned by using arrow markers, there is no need to retreat, like in Axis & Allies. You simply stay in the territory from which you launched the attack. 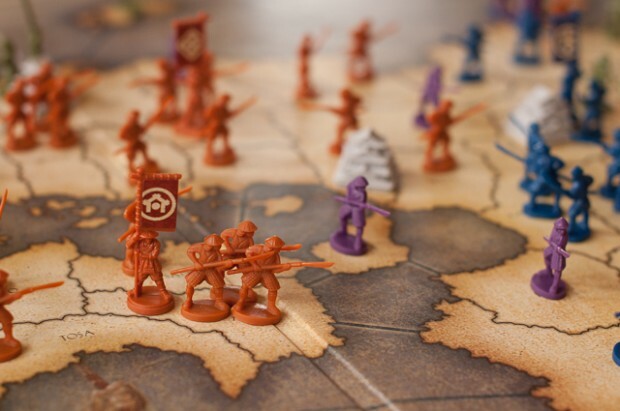 The main issue that I have with Ikusa, which is not uncommon in other war games including Axis & Allies, is the possibility of player elimination before the end of the game. Luckily, in the few gamest that I have played, players are not usually eliminated until near the end of the game. Another issue with the game is trying to catch up from behind. 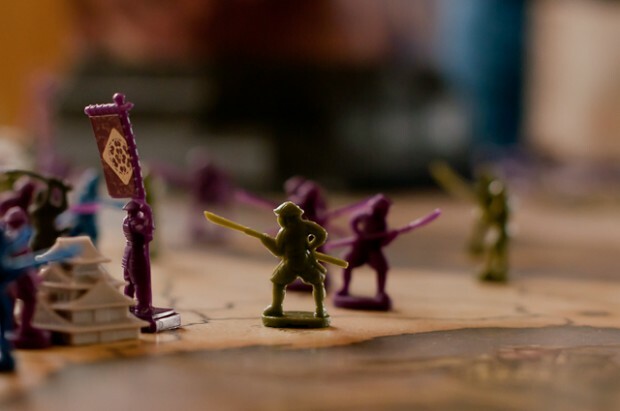 If you’re the first to lose an army, your best bet is to retreat or regroup and let your other opponents duke it out for a while. If you’re a fan of Axis & Allies or other war games, you should definitely pick up a copy of this game. You won’t be disappointed. It’s a fantastic game to play with a group of friends and every time you play, the setup is different, producing a roughly unique experience each time. 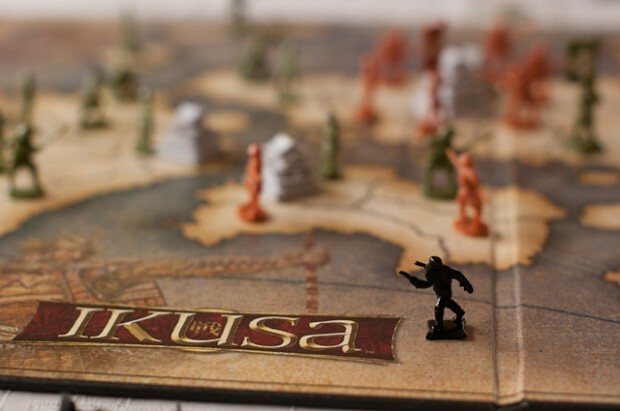 For a full and detailed review of Ikusa, including more information on the game mechanics, check out “Ikusa – Ronin Roughly Translates to…” on BoardGameGeek.com. If you are looking for a copy of the rule for Ikusa, you can download the Ikusa rules it from Wizards of the Coast.